Marco Rubio, once a young, wide-eyed Senator with a thick head of hair and a skip in his step, was once thought to be the GOP’s best bet. Now, he is a caricature of a broken robot. During a miserable showing at Saturday night’s Republican presidential debate, the Senator from Florida, perhaps flummoxed by the bright lights and the aggressive wheezing of Chris Christie, short-circuited, repeating the same talking points over and over. The bots were reportedly sent by the liberal organization American Bridge, and showed up at a town hall to mock him. 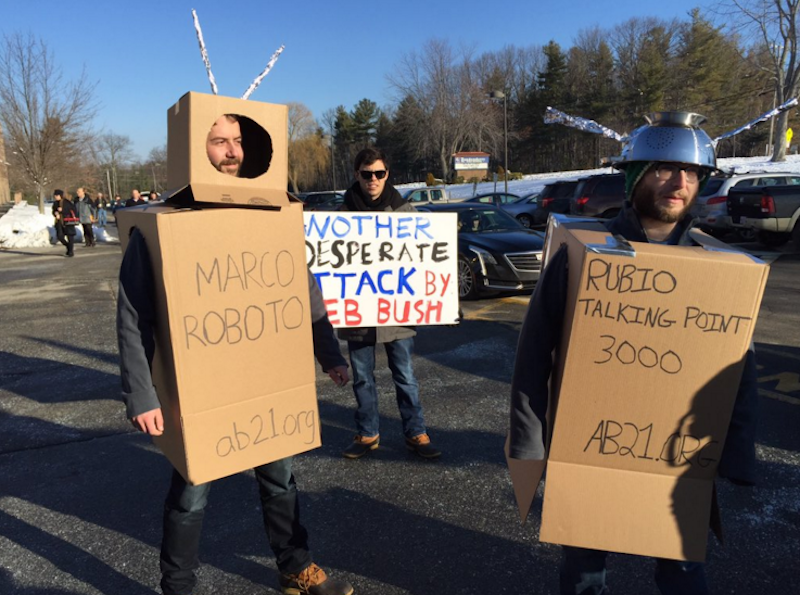 Interestingly, Rubio supporters, rumored to have been sent by the Rubio campaign itself, showed up with signs blaming Jeb Bush for the robots. Poor Rubio, he doesn’t even know who’s mocking him. For context, the canned response that the Marco-bots are mocking was actually pretty striking. But seriously, now, let’s dispel with this fiction that Marco Rubio is not a robot. He knows what he’s doing.